Neither thunder, lightning nor rain cloud this poignantly humorous artwork that references the importation of phosphorous into the docks by Albright and Wilson. Phosphorous is a key element present in all forms of life. Robert Stuart Clamp also produced a range of text for Michael Dan Archer’s sweeping nautical artwork ‘Full Fathom Five’. 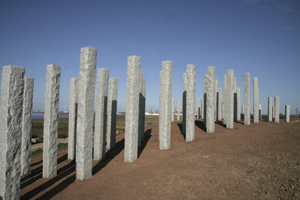 Text is carved into a number of the columns that commemorates seafarers and Portishead’s specific links with the sea. 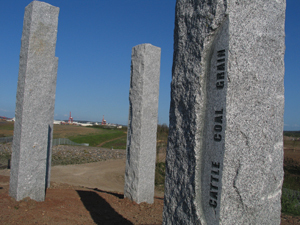 Many of the ideas were sourced during a period of community consultation on the work, in partnership with the Royal British Legion and the Gordano Historical Society. Also inscribed are lines from a specially written poem paralleling man’s inter-dependence with the sea and the journey through life. 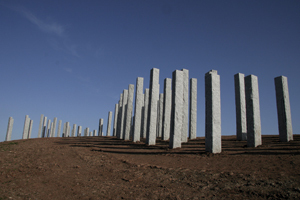 Two verses appear on the pillars, whilst the third is included on this website only. In this way the poem continues to surprise and reward those that look further. 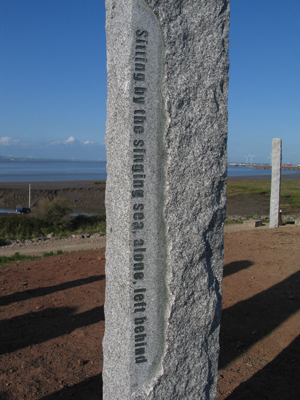 This ‘missing’ verse darkens the nature of the poem, acting as an eco warning for the sea and subsequently for man. The poem has been written so that individual lines stand alone as a prompt to memories, thoughts and feelings. In this way a different poem can be created according to the sequence in which the visitor encounters the lines. 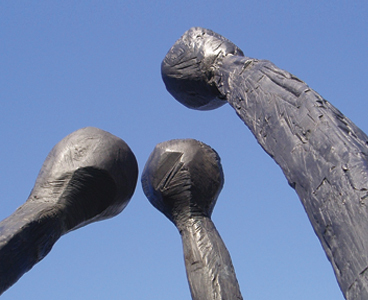 "I have also been involved as a Public Art consultant and lead artist, contributing strategies and guidelines, and engaging a wide range of artists and craftspeople through out the south west. 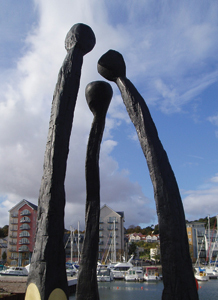 Since 1999 I have managed the Public Art Programme on the major brownfield regeneration development at Port Marine, Portishead. I firmly believe that by engaging artists, designers and craftspeople to work and share their skills and vision in collaboration with the community, stakeholders and fellow design professionals, we can improve and enhance the quality of place.